For Satya Paul Kochhar, chairman of the Madhuban Group of hotels, it is the worst tourist season in June in the hill resort of Mussoorie. “Normally, May-June is the period when most tourists come to Mussoorie due to summer holidays. After the devastation, the panic-stricken tourists went back,” said Kochhar, who owns Madhuban Highlands at the Queen of Hills. The tourism sector in Uttarakhand has virtually come to a halt in the wake of the deaths and destruction caused by floods and landslides. 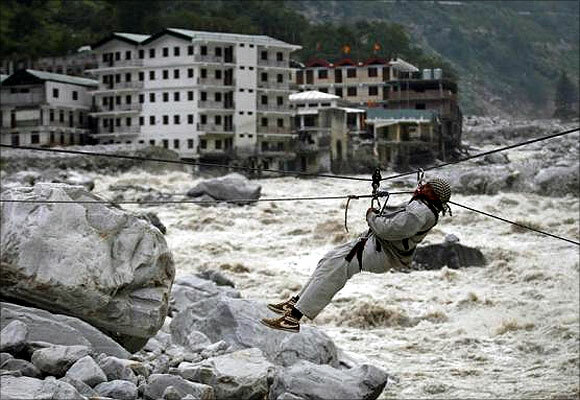 Image: A man is pulled across to safety on a rope, as damaged buildings and the Alaknanda river are seen in the background, during a rescue operation in Govindghat in the Himalayan state of Uttarakhand. 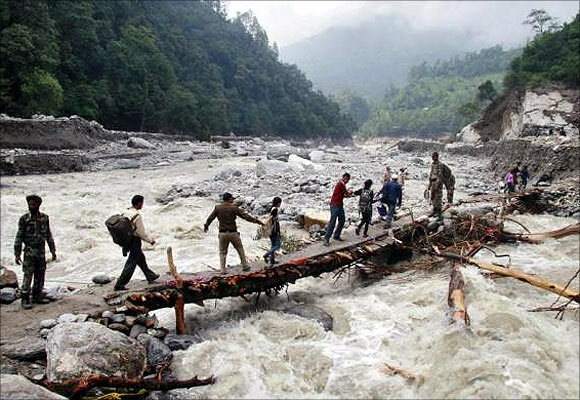 Tourism officials here said floods in Uttarakhand have brought down the business to 20-30 per cent. Hill resorts like Mussoorie and Nainital have not remained untouched. 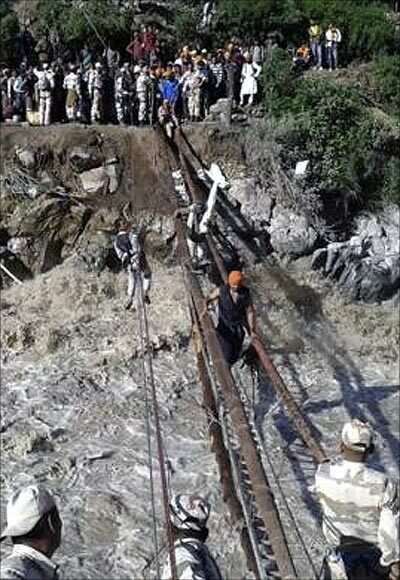 The Char Dham Yatra, considered mainstay of the Garhwal’s economy, remains suspended temporarily since last week in the wake of the natural disaster, considered the worst in the century. An estimated 23-24 lakh pilgrims come to chardham yatra every year in the Garhwal region, said A K Dwivedi, joint director uttarakhand tourism department. Image: The Indo-Tibetan Border Police (ITBP) personnel rescue stranded people across a flooded river after heavy rains in the Himalayan state of Uttarakhand. He admitted that the disaster has wreaked havoc on the tourism sector also. Eco tourism has also suffered badly in the hills. Besides, Hemkund and Mansarovar yatras have also been suspended indefinitely. 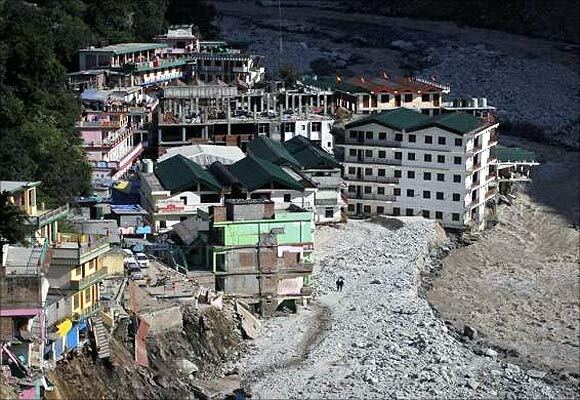 “We are also worried what will happen to all those people whose earnings solely come from the Chardham yatra season,” said Disaster Management minister Yashpal Arya. Image: Indian army personnel help stranded people cross a flooded river after heavy rains in the Himalayan state of Uttarakhand. Besides, scores of hotel buildings particularly in Uttarakashi, Rudraprayag and Chamoli districts have been destroyed completely. A couple of rest houses run by the Garhwal Mandal Vikas Nigam (GMVN) and Kumaon Mandal Vikash Nigam (KMVN) have suffered extensive damage, Dwivedi said. “The losses of tourism sector are immense and it will take a long time to assess the situation,” said Dwivedi. Hotels' occupancy level, usually 100 per cent in the peak season, is down to 10-20 per cent, as tourists fear they might get stranded. 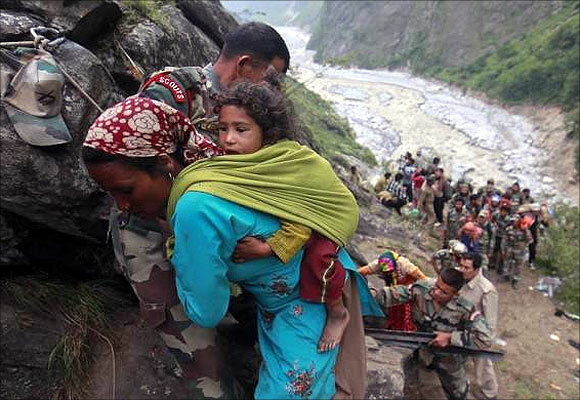 Image: Soldiers assist a woman carrying a child on her back during rescue operations in Govindghat in the Himalayan state of Uttarakhand. "People are apprehensive of coming here and are cancelling their bookings. We are not getting any fresh bookings," says R N Sharma, a hotelier in Mussoorie. With rescue mission in full swing, even the state tourism authorities are advising against travel to the state. "Please don’t come now as the state is in bad shape. All routes have been closed and all businesses have been hit because of the natural calamity," said a tourism department official. Travel companies, seeing massive cancellations, are now advising tourists to look for other destinations as the rebuilding the damaged infrastructure will take at least 1-2 years.